Have old shoes to donate? Read this! Home › Latest News › Have old shoes to donate? Read this! If you are interested in learning about what happens to the many, many shoes you donate to our store annually, please read the letter below from the More Foundation about the new Fleet Feet Sports Village in Ghana, Africa. The tools, seeds, training and other programs offered by the More Foundation to help poor farmers in developing nations are funded by the proceeds from sales of used athletic shoes. We split our shoe donations: half are donated to the More Foundation and sent to Africa and half are kept locally and donated to Home Sweet Home Ministries. Fleet feet villages are located in KETU-SOUTH district in Volta region of Ghana. Fleet feet villages are strategically located at the border town of Aflao and serve as the eastern gateway to Ghana. The villages are 200 kilometers from Accra. Glitame KLIKOR and YAWUNE villages (FLEET FEET SPORTS VILLAGES) have a population of one thousand two hundred (1200) with females dominating. The climate of the villages is dry equatorial type of climate. The rainfall is of double maxima type occurring from April to July and September to October. The dry season, which is dominated by Harmattan Winds, extends from December to February. The agricultural sector is the single most important economic sector in villages and main crops grown are, maize, cassava, pepper, cowpea and sweet potatoes. The original vegetation of the villages is coastal savanna woodland made up of short grassland with small clumps of bushes and some trees. However the extensive farming activities in the villages have, over the years, reduced the natural vegetation amid the use of several chemicals in their farming methods. The land suffers from many human activities which degrade the environment. These activities include uncontrolled sand winds, bushfires and unbridled felling of trees for fuel, timber, and clearcutting land for farming. With the support of FLEET FEET SPORTS STORES in collaboration with MORE FOUNDATION GROUP, one hundred thousand (100,000) mixed trees have been germinated in FLEET FEET SPORTS nurseries. These trees will generate many millions of dollars in goods. Profit centers in short, medium and the long term generated through food, fodder, fiber, medicine, bio-char, fuel wood, beekeeping, timber, windbreak and regenerating families’ farmland create biodiversity and sustainability. In conclusion, MORE trees help stabilize climate, create jobs, build natural resources and create a much better quality of life for all. 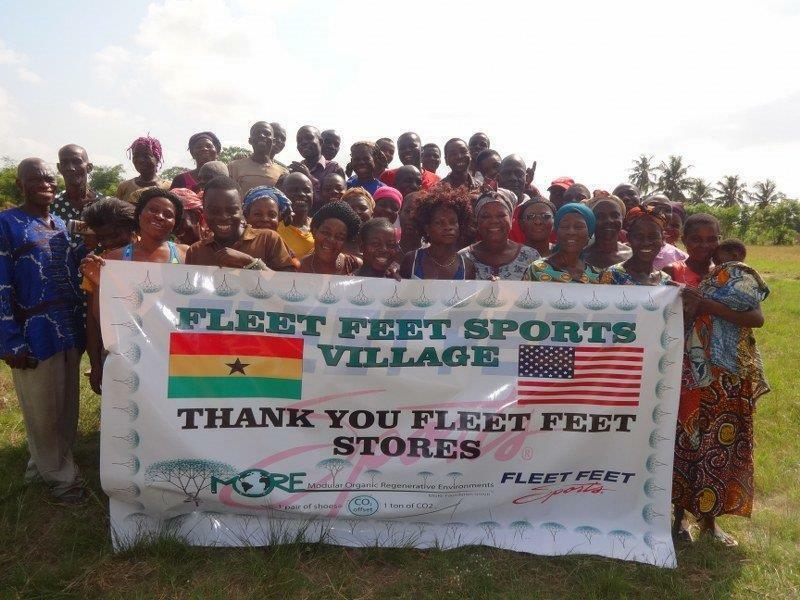 THANKS TO FLEET FEET SPORTS STORES - MORE GHANA staff.